← Sugarfina -the finest candy comes by mail! Here’s what I found at the grocery store. 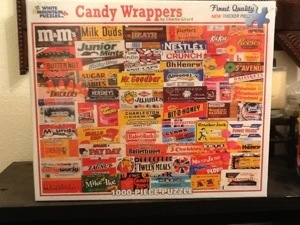 Look closely, and you’ll se some great labels and names of candies. My favorite is ” ‘Tween Meals”, you’ve got to give them credit for honesty. This puzzle will be great for passing the time on our looong winter nights. Chic-O-Sticks, and the original Flix candies! I found that puzzle above online and bought it. I am enjoying your blog!